The other day following work, cutting brush on the Banadad, Jim Raml and his dog, Blonca were walking up to his truck at Poplar Creek Guesthouse B&B’s parking lot when he spotted an all black animal headed his way. Next thing Jim knew a bear yearling went after Blonca. Unable to restrain the dog and fend off the bear at the same time, Jim called back to the Guesthouse for help. I responded! With me pitching snowballs and yelling at the bear to distract it, Jim was able to get Blonca into the safety of the truck cab and then drove-off. The bear hung around the parking lot for a bit longer and then left. We have not seen the bear since. The yearly bear after spending the winter in a den with its’ mother was likely “booted-out" to make room for this year’s cubs. The bear was wondering around in the snow hungry and looking for something to eat. At least this time it was not Blonca. 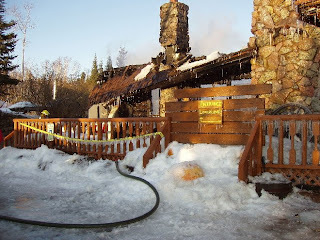 The large log lodge at Hungry Jack Resort was consumed by fire yesterday. The fire start early afternoon and by the time the Gunflint Fire Department arrived the building could not be saved. Luckily no one was injured. Cause of the fire is still unknown. This is the third time Hungry Jack's main lodge building has been destroyed by fire. The original building a rustic-log cabin build by the resorts first owner Jesse Gapen burned to the ground in 1931. Gapen had this building replace by the summer of 1932 with the help Bob Zimmerman and a crew of some forty men working throughout the winter. At the time it was competed it was the largest log structure in the Midwest. In December of 1972 shortly after Jerry Parsons had purchased the lodge, it was destroyed by fire. Parsons then purchased, a log no longer in use, Minnesota DNR building in Grand Marais. With the help of Archie Kirk Jr. and crew, the building was taken apart and moved from Grand Marais to Hungry Jack . The moving and reconstruction of this third log lodge was completed by mid December of 1993. Forest Parsons who had taken over the resort following his fathers death in December of 2006 was devastated but like his father whose log lodge building burnt to the ground shortly after he purchased the business, Forest is expected to rebuild. Some twenty-dog team ran from Gunflint Lake to Poplar Lakes Trail Center in the second annual Mush for a Cure held March 15. The event raised over $13,000 for breast cancer research. See article in Cook Country News Herald. Our award for the most outlandish customs at the event goes to musher Mark Black and "Ranger Bob"- Bob Maki, both of whom came dress in drag with lovely pink outfits. invited to be part of it. register by Earth Day, April 22. Need lodging for this important event or for the following weekend to help replant in the Poplar Creek-Little Ollie Lake area? Poplar Creek Guesthouse B&B has set-aside their lodging for these two weekend and is offering a lodging - Special to volunteer tree planters. Barbara and Ted Young owners of Boundary Country Trekking, a northern Minnesota adventure travel company and the Gunflint Trail's Poplar Creek Guesthouse B&B were featured in the latest Cook County News Herald. The article appearing on the New Herald's Senior Page was entitled, "Lifelong adventurers Ted and Barbara Young package fun for all." To view the article click on News Herald. The Gunflint Trail Association met with Joe Kempa, of the Department of Homeland Security- US Customs and Border Protection, "agent in Charge," and two other agent on March 5. The purpose of the meeting was to clarify current rules governing returning from Canada at remote locations i.e. Sag and Gunflint Lake, and other issues and concerns expressed by Gunflint Trail residents. Joe Kempa, started at the start of the meeting his regrets about the accidental killing of Ken Petersen by a Border Patrol officer but stated "that since the case was still under investigation he could not discuss it." The first question to come up was whether it was legal for ice fisherman to cross into Canada through Sag in the winter or for that matter for cabin owners and residents on the Canadian side of Sag to return to the US through Sag. Kempa after a long discussion stated it was against the law to cross into the US in the winter through anyplace other then an "Official Border" crossing office i.e. Grand Portage. He then went on to state that the Border Patrol however is not enforcing this law. Therefore folks it is your choice- you can fish or got to your homes on the Canadian side of Sag but it is illegal to return to the US but the Border Patrol may not be "looking". Kempa went on to state that in the summer, it is legal to return to the US from Canada through a remote location provided you have a I-68 form and you call-in your return to the Border Patrol. The I-68 is a photo/finger prints document that must be obtain in person at an "Official Border" crossing office. Mike Prom, of Voyageur Canoe Outfitters stated that , "this not a very convenient option for someone coming from Chicago and who is planning to go into Quetico on a canoe trip." It was noted that there are special video-phones that have been installed at other remote border crossings in Minnesota that would deal with this problem. Congressman Oberstar has stated in the past that he would help secure these phones for at least the Sag Landing and on Gunflint Lake. Prom said he would follow-up on this with Oberstar. The question was then raised about Border Patrol agents that have been traveling at excessive speed on the trail, particularly through the 40 m.p. h. in the mid trail area. Kempa stated that after hearing from many people about this, he has issued a memo to his officers that they are required to obey the legal speed limits. He did go on to acknowledge that while Minnesota State regulation require that official vehicles responding to an emergency must have their flashing red lights and/or siren on, the Border patrol is not required to abide by this State regulations. Therefore Border Patrol officers sometimes maybe speeding when responding to an emergency call and not bothering to turn on the lights or sirens. The final item discussed was the impress by many Gunflint Trail residents that the Border Patrol officers were not very friendly or willing to talk to local residents. Kempa agreed he has heard this concern and will try to encourage his officers to be a bit more open with the community. He stated that, "this meeting is at least a start in this direction." Bed and Breakfast. Charge for luncheon- $10.